We've now made five recipes in my local Whole Foods' Supper Club. I love this focus on whole foods and plant-based dining, and I especially enjoy being forced to step outside of my comfortable boundaries and try new things. It's been absolutely delicious! I've never had a "regular" Waldorf salad, so I don't know what it's supposed to taste like, or what designates it as a Waldorf, but this was really delicious. I may have made the dressing just a tad too thin and watery, but it still tasted good. I ate these too quickly to get a picture of them. I think I ate half the entire recipe in the first night. So, yeah, they were good. Hey! I am putting together a vegan community blog. 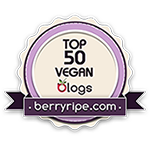 It is a blog where any vegan blogger can post whenever they want, promote what they want, pretty much do whatever they want. If you are interested and have a blogger account just send me your blog account email to kaycee@donevegan.com and I can add you as an author so you can freely post, or you can send any submissions to submissions@donevegan.com and I can manually post them. Let me know if you are interested in contributing and I can send you more info if needed.